INDIANAPOLIS -- If Darqueze Dennard didn't enter the NFL Scouting Combine as the draft's top cornerback, he may well have exited it with that distinction. He solidified any questions about his speed Tuesday on the combine's final day of testing for cornerbacks and safeties, with an official 40-yard dash time of 4.51. 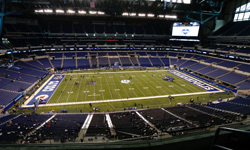 Here are some of the other things the College Football 24/7 team learned at the combine in Indianapolis on Tuesday, the final day of the event. Some NFL players are not on the Johnny Manziel bandwagon, but the former Texas A&M QB can count on one of the league's top cornerbacks welcoming him with open arms if he's drafted by the Cleveland Browns. Browns CB Joe Haden said Tuesday that he's a Manziel fan. "I would have no problem with it," Haden said of Manziel potentially landing with the Browns. "... I love the way he plays, his passion. You need that, especially with the young team we have with the Browns. He would bring that fire to us, just the excitement. With Johnny Football, you never know what he's going to do on any play. I like that about him." Vanderbilt safety Kenny Ladler took a tumble after one of his 40-yard dash attempts on Tuesday, but recovered nicely by going into a forward roll. Speaking of rolls, roll the tape. An anonymous NFL starting quarterback put Central Florida's Blake Bortles ahead of Texas A&M's Johnny Manziel as the NFL draft prospect who could win more, according to cleveland.com. The Cleveland Browns could very well invest the No. 4 overall pick in a quarterback, and the options include not only Manziel and Bortles but Louisville's Teddy Bridgewater, as well. Fans in Cleveland are starved for a winner right now, however, and NFL Media analyst Mike Mayock sees Bridgewater as the quarterback most NFL-ready in the short term. Will the Falcons return the love to Jadeveon Clowney and do whatever it takes to fill a need at pass rusher and land the draft's most intriguing talent? Falcons GM Thomas Dimitroff was asked by NFL Media's Kimberly Jones for his reaction to Clowney's comments that he would love for the Falcons to trade up and get him. "That's great to hear that from someone," Dimitroff said. "I'm sure he's saying that to everyone, as well. He's making sure he follows back around." Dimitroff is too smart to tip his hand, but he didn't shut the door on trading up or down. That said, if the Texans end up taking a quarterback with the first overall pick, we have to imagine it will be tough for him to resist the urge to pull the trigger on a deal to move up to No. 2 if the Rams are willing to move down. The results of Johnny Manziel's combine performance in interviews with teams are coming in, and it sounds like the former Texas A&M quarterback nailed it. A report said the Jaguars thought he was very impressive and the Raiders apparently agreed. It's only getting harder to envision Manziel not being picked in the top five. The appealing thing about combine results for NFL coaches and scouts is that everything is quantified. Performances can be measured to the hundredth of a second, to an eighth of an inch, and the numbers don't lie. Evaluating character, by contrast, can be a far more arduous task. And as NFL Media reporter Albert Breer writes, that process starts way before the athletes gather in Indianapolis with some of the most exhaustive background searches imaginable. Khalil Mack of Buffalo to the Falcons with the No. 6 pick? Two big ifs first: If Mack is available at No. 6, and if the Falcons go with a linebacker. But if he is, and if the Falcons do, word is they like Mack over UCLA's Anthony Barr. Whether it's Mike Mayock, Bucky Brooks, Adam Schein or Shaun O'Hara, everyone is in agreement that Aaron Donald left the combine Monday as one of its biggest stars. He might not have ideal size, but Donald has been building momentum throughout the draft process and might find his way into the first round after a strong showing in Monday workouts. No one was more effusive in his praise of Donald than O'Hara. "I think this kid's already a better pass rusher right now than Ndamukong Suh was when he was coming in," he said. Clemson wide receiver Sammy Watkins wasted no time getting back on the workout grind after leaving the combine. He posted this Vine clip of himself Tuesday, getting further prepared for Clemson's pro day event on March 6.